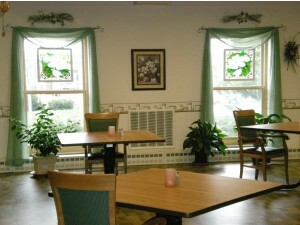 Home cooked meals; each diet is keyed to the resident’s taste and needs. Our menus are overseen by a Registered Dietitian ensuring they are nutritious as well as delicious. Residents are given menus weekly to make their choices for what they want the next week with the assist of family or staff. The menus are posted daily in the main hallway. Guest trays can be obtained for a nominal charge, by calling the kitchen at (715) 885-8312.